It’s heartening to see we aren’t stuck in some delusion of grandeur. We aren’t the only ones who love us. We’re not just about recharging and coupons. There’s more love where this came from. To be continued. service is very active and reliable I like freeCharge Service. but it website did not give cash discount for a valuable customer ……………. Thanks FreeCharge and all the team of FreeCharge. Marvelous site. Prompt response & time saving site. “Maja aa jata hai is site par recharge karne se”. Thanks for you team & supported staff. Its a awesome site.i alws used to recharge through easymobilerecharge.com for 2 years.i paid rs 2 extra for each recharge but in freecharge is far better than any other recharge site.i also recomend my friends to recharge though it.YOU ROCKS FREECHARGE….I LOVE IT. ITS NICE SERVICE FOR PEOPLE AND I APPRECIATE THEIR SINCERE EFFORTS ALWAYS TO HELP PEOPLE. ALL THE BEST. KEEP IT UP. Its very fast and easy services. Customer care support is excellent… Our money is safe if recharge was not successful… Good.. Keep it up..
Gr8 service n quite quick too. Please promote fre recharge….It is genuine!!! guys recharge ur nos …sitting home….!!! Service is awesome!!! Instant recharge, I like credit account facility.Though recharge could not succeed, you don’t have to worry about it as it is safe in credit. Suggestion:There should be credit account for coupon balance. In this account total coupon balance should be maintained, so that one can use this coupon balance to purchase something when they want. it is gud, easy, fast, secure and free! Hi Your service is great. But MTNL Recharge Not given on time please suggest. Only thing I don’t like is – no information on full talk time offers. So I have to go to official website of Airtel or vodaphone to see it. It is very problametic. 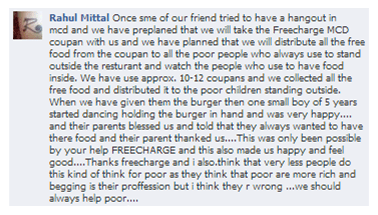 Due to this freecharge is looking more customers. We’re on it. Watch out for the update. it was such a magic moment for me when i recharged. its really superb………………. It is faster than maggi making.. Ha Ha…. Good.. Keep it up. This is excellent Website than other Recharge Websites. I Always use coupons got from Freecharge so i never feel than i spend money on recharge. Its truly free recharge. It’s really awesome! Keep going! You guys rock! Nice experience, using this service from 4 years. And its all over good. please add some higher price coupons wit less Conditions, for movies include City Pride if possible..
Supreb….reliable and very active till now…. This is really very best and trusted site. And I really very impressed for this site. Thanks for giving such usable free site to us. It is an awesome offer for the publics to get a freerecharge coupon in an easy way . Myself, biki and i have done this for me and for my famalies many times. Such type of golden opportunities may get some time so we must have to enjoy with this offer. Thanks to all. updated version, its easy to recharge……. It’s a Good site for online mobile Recharge but now a days it takes time to get recharge !!! this is really a trustworthy site for recharging. Thanks a lot FREEcharge. Thanks for free e-recharge …..! Pls introduce option of printed coupons in case of McDonalds coupons, which are now delivered as printed coupons only. In case of printed coupons, user will get coupons immediately as well as it will be absolutely free, user will not be required to pay Rs10 as delivery charge. It will also reduce workload of freecharge. I have plenty bottles then what should I do if I get chance to make free recharge only once. give me solution fast. it doesn’t have a sample how to enter promocode and it is not complete in 3 steps. it is asking email id and even if you enter correct password it says enter the correct password. and where is the option to enter unique promocode.it has lot of things but non sense for me. nice and very classic thanks buddys………….. 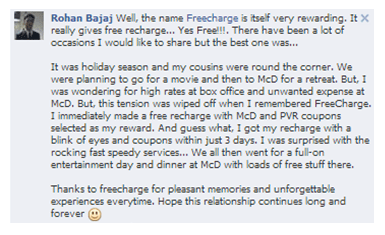 I always make my recharges through freecharge…..
not a pepsi contest ,other normal recharges also done in this website. Really a reliable and awesome recharge site. It is very nice & fast recharge facility. Freecharge makes my recharge so simple and easy…..